The old Gaelic harps preserved in the museums are astonishing art objects, pieces of sculpture in wood and metal. 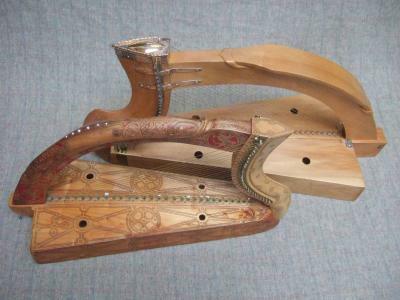 But they are also musical instruments, designed to create and work with a powerful and subtle ancient sound world. Of the 18 instruments surviving from before 1800AD, none is in good enough condition to string and play, and anyway museums and conservators do not allow such access because the act of installing strings and bringing them to tension on a unique historical object would cause much damage and risk. But, the music of the old Gaelic harp traditions is still a fine art form, and musicians today want to play the repertory and to experience the sound of an early Gaelic harp - a sound that was praised in glowing terms by writers from Giraldus Cambrensis in the 12th century through to Frances Bacon in the 17th. To bring to life this ancient performance art means studying the style, technique and repertory from the historical sources, but it has to be actually played on a physical instrument - and since the original museum harps are silent, we depend on replicas made by skilled craftsmen. It is a challenge for a modern harpmaker to produce work as good as the historical makers, but the effort of trying to emulate the quality of work of the museum instruments means that the most accurate modern replicas are truly glorious art objects both to look upon and to listen to. First published 26th November 2004.